In case you hadn’t noticed, the World Cup has arrived – a shouty, colourful juggernaut, annexing the media and urging everyone to care about gameplay strategies, national characteristics, goal technology, even hair. Whether you’re a devout fan or an indifferent outsider, sporting events of this scale only invade our consciousness every so often; and the appeal of the beautiful game, even outside major tournaments, has never been so mainstream. So, whether you are gagging to indulge your footie obsession or simply trying to understand what all the fuss is about, here are ten football books you should read over the next few weeks – and one you definitely should not. Comprehensive is a big word. So is encyclopaedic. But Goldblatt’s roving tome manages to be just that. 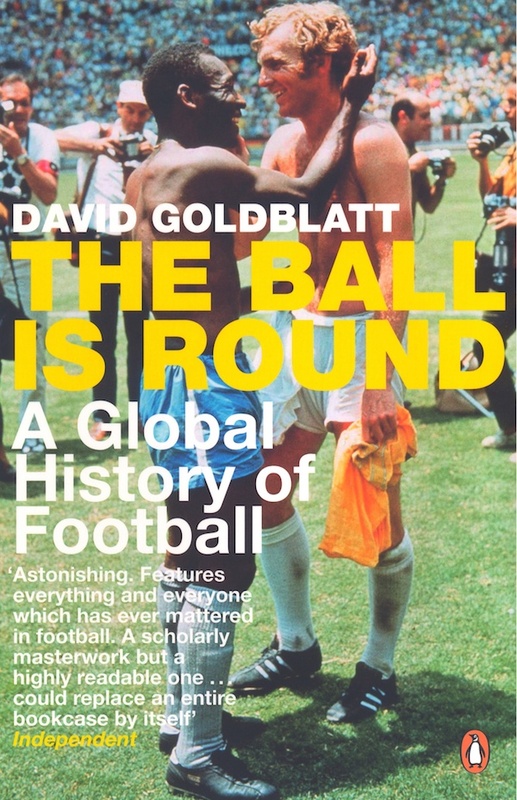 A history of football from its early instantiations in Chinese and Mayan culture, right through to 2006, the book’s scope is extraordinary, peppered with anecdotes and references, but taut and lively in its style. Goldblatt’s achievement is magisterial, and if you choose to read only one of these books, make it his. Football’s joy is that it is at once a personal and collective experience. You cheer or cry or swear with thousands of others, but the memory of what mattered, of what inspired or destroyed you, is also individual. Galeano pulls together a series of footballing vignettes that go towards making his own memory-horde. Beautiful descriptions of goals, players, and matches are penned with flair, as Galeano maps out his relationship with the game he adores. The Dutch invented total football and gave the world the brilliance of Cruijff, Neeskens, and Krol. Winner sets this tale against a remarkable backdrop of art, architecture, literature, and history, and does it without ever sounding too clever or pompous. This is as canny a marriage of subject matters as you are likely to find, and hugely entertaining. In truth, The Blizzard is not a book, but a lavish quarterly magazine, edited by one of today’s foremost football writers, Jonathan Wilson. Frustrated by the paucity of good writing about football, Wilson lets a myriad of thoughtful writers off the short-form, quick-turn-over leash, and the result is a distillation of the best long-form sports writing around. This book made me cry a little and I am not ashamed to admit it. Robert Enke was a talented German goalkeeper who battled episodic clinical depression and took his own life as his career was reaching its pinnacle. Reng tells a story, with pathos and style, about mental health and the pressures of modern sport. Bill Burford was the editor of Granta when he indulged his gonzo journalism wont and produced this vibrant account of football hooliganism. Burford captures both the excitement of street warfare and the sadness it causes without ever rushing to judgement and, in doing so, provides a superb account of the social backdrop to 1980s football. Ahead of the curve, Kuper and Szymanski use economic theory and big data to address the foibles of the transfer market, why certain teams do well in tournaments and others don’t, and apply game theory to penalty kicks. Cerebral and informative, this is Freakonomics for football. There is not a lot of good fiction set in the world of football – a mystery to be addressed another time – but one author stands out. Peace’s complex book about the irascible Brian Clough’s ill-fated tenure as manager of the club he most hated, Leeds United, is dark, feisty, and staggeringly well-written. Written for an academic audience, this is nonetheless an accessible and wide-ranging introduction to the study of football. It addresses everything from sports journalism to the origin of the sport in English public schools to the globalisation of football under FIFA. A genuine classic, Hopcraft’s fluid style and breadth of knowledge make this series of essays about the game one of the finest collections of sports writing in English. Written in an era when sports writers had a greater freedom to express themselves, this is prose that at times rises to poetry. Credited with making football acceptable to middle-class readers, Hornby’s enormously popular book can be distilled into the idea that clever people can like football and still be clever. It’s the one book that people who don’t read about football have read… which should tell you all you need to know.